Longer days during the summer are a wonderful feature of the season. 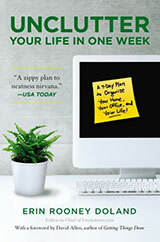 It’s a great time to tackle tasks that require working outdoors. If you live in a house or townhome, summer is also the perfect time to organize your garage (if you have one). Get it out of your head. 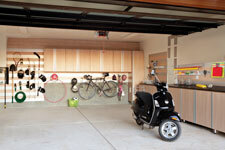 Jot down the things you need to take care of in your garage. Your list doesn’t have to be massive, though there is nothing wrong if it is. Focus. Pick the one thing (or two things) you’re going to work on first, and break this big task into smaller, actionable steps. Work in short time blocks to maintain focus without feeling stress. Group like items. Put similar items together in categories — tools with tools, car repair items with car repair items. Hold yourself accountable. Select a deadline for completion and put it on your calendar. Be realistic about how much you will be able to accomplish based on how much time you have to work on your project, as well as how much help you’ll have. Get help. Partner with someone or several someones to help you get things done. Pick a reward. This is perhaps the best part of the plan, besides actually completing what you set out to do. It can be very motivating to have something to look forward to when the project is finished. Not everyone needs this, but it can be helpful. With this plan in place, think about your main goal(s) for getting the garage more organized. Do you want to fit the car(s) inside? Do you need to find things more easily? Would having a place for storing bulk supplies be helpful? If you feel overwhelmed, referring to your main goal will keep you calm, focused, and ready to continue. Do you really need everything that’s stored in your garage? How long have the widgets been sitting in the widget box? Substitute “widgets” with things that you’ve been holding on to because you might use them “someday.” And, speaking of “someday,” when was the last time you used them? Do you still remember why you’re keeping them? Does anything in the garage belong to someone not living in your home? Once you’ve decided what you’re going to keep, gather these items together so they’ll all be in the same location. If you have similar items strewn about in various parts of the garage, it will be more difficult for you to find them when you need them. Once you come up with your zones, sketch the garage (with wall dimensions) to see where you will store items. For example, you may want to keep bulk paper products closer to the entry door to the garage. By doing this, you will avoid going into the heart of the garage for items that you will use inside your home. A popular garage organizing option is to use shelving units (e.g. free-standing units or a track system, like Elfa Utility Garage or Rubbermaid Fast Track System). The benefit of using shelving is that you won’t have to stack containers on top of each other. Stacking means that you’ll have to remove one bin to get to another, a process that would likely stop you from reguarly putting things back where they belong. Pegboards and slatwall systems allow you to use the walls to hang items that you use often (like brooms, rakes, hammers). Cabinets with or without doors may also meet your needs. Consider adding other components depending on your lifestyle (e.g. a vertical bike hook). Once you’ve selected your shelving, choose clear, sturdy containers (remember to add labels) to group your like items together. Be sure to get containers with covers to protect the contents from dust and crawling critters. You can choose lids of the same color to store certain categories together (like red lids for all painting supplies). Armed with a plan, you can attack your garage organizing project in small chunks so that it’s manageable and not overwhelming. Your car and future self will thank you for it. I’m a human of the “keep it for some day” variety. Yes, I’ve had some things for years, but I also do lots of projects and you know what? I USE those things. I can’t tell you the satisfaction of needing, for example, some kind of primer that will help hold tiles onto vertical surfaces, and finding a full quart I paid $1 for at the thrift store. In this case (which happened yesterday) I saved time, gas, and another $19 going and getting it at the notorious, rip-off big box store. If you have room for inventory, and I do, the trick is really keeping it organized and labeled, not being a wasteful consumer and “getting rid of it all.” If I were to give advice, it would be to keep lists on the computer (because they’re easy to find and easy to backup by emailing them to yourself on a web-based email server)of all the things you pick up at the Habitat store or Rebuilding center or have left over in sizeable quantity from another project. Another value I find constantly is, if I’ve run up on some unusual task or fix that requires creative thinking to solve, I can scan my various objects and VERY often see something that makes me realize Oh! THAT would work! There’s a big difference between having jumbled piles of tools and supplies that are worthless because you either forget what you have, or can’t find it – and having many, many solutions and supplies that end up being just right for your needs. I made a cool “parking zone” for my son’s bicycle and scooters by putting colored electrical tape on the garage floor to stripe out parking spots just for him. He thinks it’s cool to park his outdoor toys in their spots and he knows that they need to be inside of the parking zone so mom and dad’s vehicles can park indoors, too. One other thing we like in our garage is our shoe rack mounted on the wall right near the interior house door. It’s super convenient to keep our sneakers, gardening clogs, etc. out of the house ~ seeing that shoe rack is a reminder to take them off before coming indoors. I might be a crazy freak, but I LOVE to organize and clean our garage ~ it’s so much easier to maintain a well-kept garage than it is to wait until it’s out-of-control, jumbled and dirty and waste a whole day getting it back in shape. Plus, keeping one of your biggest expenses/investments (your vehicles) inside a garage (safe from bad weather, vandals, etc.) seems like a no-brainer. When my sister turned 50 last Labor Day, her gift from me & our parents was a garage ‘makeover’. Her main goal was to be able to park both vehicles in the garage and we made it (barely – it’s a pretty narrow 2-car garage). She already had a whole wall of shelves built-in that just weren’t being used to their best advantage. We switched her son’s workbench from one wall to another, took a big load to the hazardous waste recycler, another load to the Habitat Re-store, a lot of outgrown kid toys to Goodwill, and hung the 2 bikes they kept from the ceiling. And having paid a visit a few weeks ago, I’m happy to say she’s kept it clear and both vehicles still fit! With global warming this is no longer the season to clean out the garage. Too hot! But a great time to clean out the nice, cool basement. I’ve spent the last few weekends doing just that. As a thrift store junkie, I see people purchasing things that I personally would not purchase because of their quality or condition, and I see beautiful, pristine things being passed up all the time. I find it is best to donate things based on their functionality. This post is definitely slanted for the far flung suburbanites. For those of us who.live in the city or in the close in suburbs, a garage as large as the one pictured n the photo is but a distant dream. Our1928 garage was built to house a model A Ford, so it’s really narrow. There is no way a modern day car could fit in there. The beauty of a small,garage is that there is less,room to accumulate stuff ! One of the reasons I was thrilled when we bought a house was to have a garage to finally park in, especially during the winter. However, as it turned out, we had a pretty bad mouse infestation problem, so they ended up building a nest over my gas tank, chewing through some wires, and costing me $300 to fix. After that, we got an exterminator in, but I haven’t wanted to take the chance with my car again (we live in a heavily wooded/wetland area in the Northeast, so we’re always dealing with some kind of critter encroachment, and during the freezing winters a warm car in a garage is an attractive shelter for mice), so in the years since I have just continued to park outside, even though there is plenty of space to park in the garage. Anyone else struggle with this issue? This hit my mailbox just as I finished writing a post called School’s Out – A Summer Schedule. Organising the garage isn’t on it! But we did do it a few months back. The thing with storage is that outta sight isn’t always outta mind. I find just knowing the stuff’s there weighs heavy. Clear if you can, I think that’s always the best policy! I’m willing to give garaged items longer between uses — they’re not in the prime square footage where we pay to have things air-conditioned. 🙂 Until I actually fill up all the garage cabinets, I don’t think I’ll rotate anything out purely on duration. I’ve already disposed of quite a bit during normal cleaning. Years ago, I owned a side business operating arcade video game machines at a few local hobby shops and laundromats and such. At my peak I owned about 30 machines at the same time. To maintain such a fleet, I had to have a non-trivial array of tools, parts, and equipment, and it took up a few shelves and about half a cabinet at my house. I would also usually have at least one or two games in various stages of disrepair/restoration garaged also, taking up some space. After closing off the business and selling the games, I had considered giving the workshop stuff away, but it had been difficult enough to gather that I decided not to dump it until I was absolutely out of room. Fast forward to this year: some friends and I got some cheap square footage and we’re opening a hobby gaming shop and vintage arcade. While our buildout is underway, my garage has (temporarily) turned back into my restoration warehouse for arcade games. My wife shares my frustration at having to park the van outside in the Arizona summer heat, but in a few more weeks I’ll be able to move the games to the new store — as well as all those tools, parts, and equipment. Which I am now very, very glad I kept. And then the garage will be gloriously empty, or very nearly so. 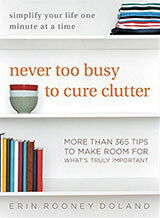 Uncluttering isn’t pure minimalism, as this blog has said before. What it really is, is putting things in their place, and getting things you don’t need all the time out of your way. A garage is a decent go-between for those things you know you don’t need all the time, but you figure you probably WILL need again eventually. As a rule of thumb, I would say that as long as you can park your car in it (on a permanent basis, haha), your garage is probably not too full. Reorg’ing the garage is definitely on my list, but not during the heat of summer. That’s a spring or fall job in my neck of the woods. Ditto the attic for the same reason. In the heat of the summer I take the opportunity to do work in the basement, which is quite cool. Great post! Seems to be instructive as well as informative! While organizing garage, there are options like storage organizers, ceiling storage and wall organizers. These not only keep garage organized but also add to the decor. We always acquire clutter in the garage over the summer when we park cars outside. We usually clean it out around Labor Day to prepare for the coming winter and snow. The photo is misleading. Don’t you just love how they uncluttered their garage by getting rid of their: hot water heater, furnace, laundry machines and cars?